According to him, “building a career in the University doesn’t come easily, concrete steps have to be taken and this can only be achieved voluntarily by one’s own personal efforts especially in today’s globalised world.” Prof. A. Afful-Broni urged them to join academic bodies, look for mentors, undertake quality research work and publish in their field. He further emphasized that they should let their qualification and publications be synchronized and desist from carrying out research in areas outside their field. He encouraged them to ‘let the world know that you are experts in your field’. He made these remarks at the orientation held for newly appointed faculty members of the University on Wednesday, 25th January, 2017 at the Registrar’s Conference Room, whiles delivering the welcome address on behalf of the Vice-Chancellor and presenting on the topic “Crafting an ‘Academic Career at UEW” Rev. Fr. Prof. Afful-Broni said it was his hope that the young and upcoming faculty members, would take after them on their retirement from active service. The Deputy Registrar in charge of Human Resource, Mrs. Christie Okae-Anti, presiding over the workshop, commented that being a faculty member of UEW attracts many benefits including housing, hospitality, financial, health and education. She informed members that it was very crucial to update one’s record as the years go by and it becomes necessary. However, she added that, they should make use of internal resources like the Division of Human Resource and Division of Publications and Communication, Library, Pro-Vice-Chancellor’s office among others and feel free to ask questions and solicit information from any of the offices whenever it becomes necessary. The Director of Quality Assurance, Prof. M. K. Amedeker, took the new lecturers through ‘Academic Excellence’ as a whole. He said that as newly appointed lecturers it is important to know the core values, vision and mandate of the institution that they are working for in order to work with them and move in the right direction. He stated that it is important to follow policy objectives that aim at smooth organization of programmes and courses. As lecturers, it is of great importance to ensure quality teaching takes place since it is the University’s mission to train quality teachers for all levels of education. He continued that it is important to interact and network in order to learn new things and ensure best practices in teaching as well as the preparation of adequate notes. He urged them to prepare course manuals and review programmes at their Departments periodically to ensure Academic Excellence. 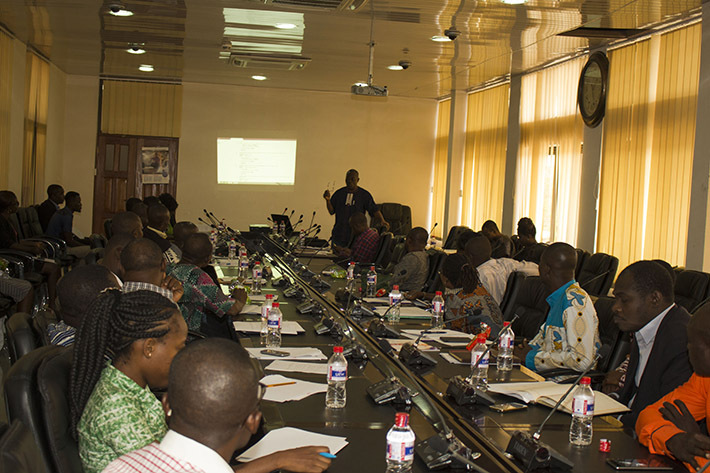 The workshop also had two presenters from the Departments of ICT and Mathematics Education, Dr. Tony Kwaa-Aidoo and Mr. Jones Apawu. They took members through ‘IT Support for Teaching, Research and Information Security’. Mr. Jones Apawu informed members that Learning Management System is a software that lecturers can easily access for teaching and learning. Mr. Apawu stated that the web based software that is accessible by browser is beneficial to both students and lecturers. Lecturers can upload their course materials, quizzes, surveys, give assignments and even upload videos on concepts and students can also download the materials using the same browser. He added that a lecturer must not only have pedagogy but also add technology to his teaching. Dr. Kwaa-Aidoo, on his part, threw more light on issues regarding Security at Work and cautioned the new members of staff to be wary off people like crackers and criminals who will pose as decent individuals but are a potential source of danger to us. He said that apart from malware the greatest risk that people normally face is social engineering (where one uses certain rules to get information from another). He stated that staff members are responsible for their accounts on the University system and should be careful about the information they give to people around them. The Assistant Registrar in charge of Student Records Office, Mr. Raymond Boison said the Online Student Information System is very crucial in the life of lecturers on campus. Speaking on the role of lecturers on OSIS usage, he demonstrated how to use the system and remarked that every activity undertaken on OSIS is recorded hence members are responsible for everything that goes on in their accounts. He advised new users to be security conscious and avoid giving their account or details to anyone regardless of how trustworthy they may seem to be and encouraged lecturers to change or reset their passwords whenever they felt their accounts had been compromised or lodge an official complaint at the Student Records Office. The Dean of Student Affairs, Prof. C.W.K. Mereku and the Director of Counselling Services, Dr. Paul Bedu Addo presented on “Students Affairs and Helping Students in Distress”. Issues touched on included finances, sexual harassment, hostel accommodation, unethical issues, academic work, poor time management, medical and marital issues among others as the many challenges faced by students. They advised the new lecturers to treat their students with respect, empathize and listen to them and try to ‘help them if you can’ and apply the rules when it is necessary. The University Librarian, Mr. Viscount Buer took members through ‘Information Access’ –Winnopac at the University Library. He said that plagiarism in Ghana was a serious issue and lecturers should help students not to plagiarize and they themselves should also desist from the practice. He stated that they can help students to overcome this by not overloading them with too many assignments to submit at the same time and added that there are books at the University Library as well as electronic resources they can access for their studies. He said that the use of old books by Faculty members posed a challenge and the Library is always ready to help them find and purchase new relevant books, and, he encouraged them to scrutinize catalogues sent to them for the purchase of books and give the Library the necessary feedback. He said that as a young lecturer, fifteen percent of your salary should be spent on buying books if you want to develop yourself. ‘Invest in yourself and reap’, he said. Speaking on behalf of the Finance Officer, the Deputy Finance Officer Mr. Frank Owusu Boateng, explained to the lecturers issues pertaining to the payment of School Fees and Vice-Chancellor’s Scholarship Fund. He said that students face various forms of financial difficulties, hence it is important as lecturers to be knowledgeable in these processes so as to guide and counsel them when the need arises. Mr. Owusu Boateng stated that retirement and managing retirement benefits are also very important as young lecturers, therefore, the need to prepare adequately towards it before attaining 60 years. 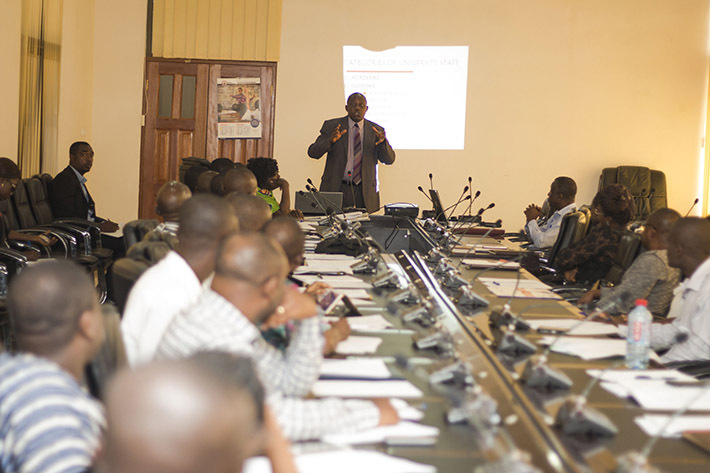 He enlightened members on the need for advance planning, options available for investing retirement benefits, pitfalls in managing retirement benefits and how to avoid them among others. The workshop was coordinated by the schedule officer in charge of Staff Training and Development, Mr. Isaac Darkoh of the Division of Human Resource.